SYCAMORE GROVE: My initial response to the three parts of this query: no, no, and no. As this causes deeper examination, though, I observe a personal uneasiness arising from a sensitivity to those “less fortunate,” a reaction that would prefer to look the away from distress. My first reading of the query – and my response at that moment – is financial. Although not lacking for daily bread, at times in the past several years I’ve been reminded how I am the “less fortunate” one; at other times I’ve been shown just how precarious my own situation is, financially and other ways. Thus, I feel a great inadequateness in responding to the material needs of others, even within the Meeting. In reading the query again, another facet appears – one involving emotional and spiritual dimensions. A concern for offering material comfort is my attempt to compensate for an inability in extending a more essential kind of assistance. Too often I’ve known “duty” and “obligation” instead of genuine love or even acceptance. Such feelings of fear and inadequacy are difficult to face, much less confess. 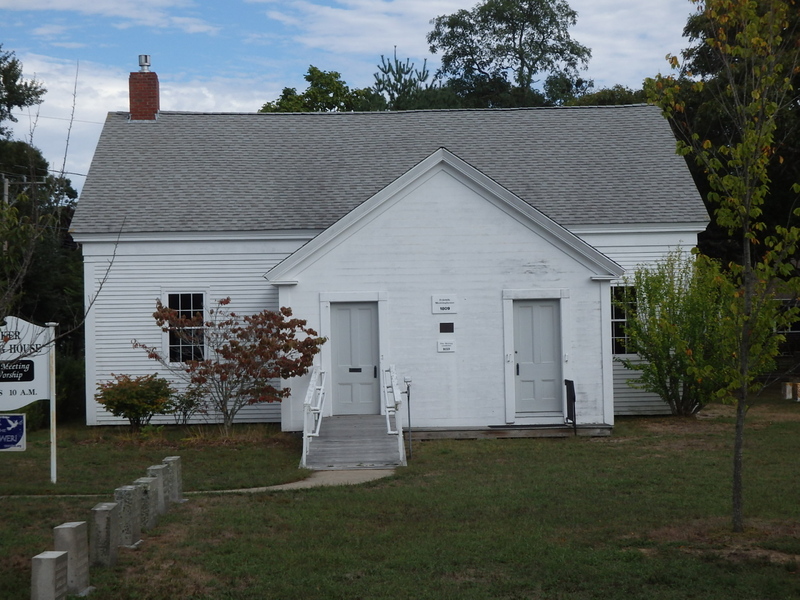 The Yarmouth Quaker meetinghouse on Cape Cod is distinctive in that the traditional women’s side, on the left, was much larger than the men’s side, on the right. The reason, we’re told, is that many of the men were often out to sea. JANE’S FALLS: This query seems to have two elements: material goods and emotional conditions. There is so much need all around – the homeless, unemployed, imprisoned, impoverished, illiterate, and so on – that I quickly feel overwhelmed, especially living apart from family and spiritual community within my neighborhood; I feel how little I can do in the face of this, especially when the real needs may be much deeper than those that can be seen. From this sense of great inadequacy, there too often arises a hardening within me, a wall between those in need and myself.